Artists and the Avant-Garde Theater in Paris, 1887-1900, National Gallery of Art, Washington; National Academy Museum, New York, 1998-1999, no. 66, as L'Ennemi du peuple (The Enemy of the People) by Henrik Ibsen. Crauzat, E. de. 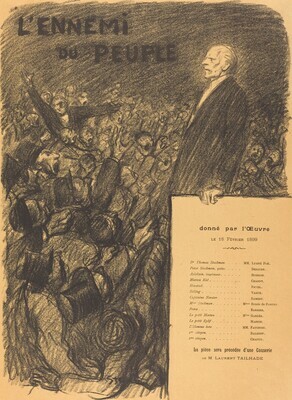 L'oeuvre grave et lithographie de Steinlen. Paris: Societe de propagation des livres d'art, 1913. Aitken, Geneviève. Artistes et Théâtres d'Avant-Garde: Programmes de Théâtre Illustrés, Paris 1890-1900. Exh. cat. Pont-Aven, Musée de Pont-Aven and tour, 1992, 90, no. 104. Artists and the Avant-Garde Theater in Paris, 1887-1900. Exh. cat. National Gallery of Art, Washington; National Academy Museum, New York, 1998-1999: no. 66.